Wild growth of invasive alien plants is an environmental issue in Kerala, intensified after the Kerala floods. Invasion by alien plants affects the survival of local species, damages soil quality and affects groundwater availability. It also indirectly affects animals by intruding the food chain. Proper surveillance and monitoring, treatment of imported materials that could be carrying invasive species, increased research and attention along with reconstruction efforts in state policy is the need of the hour, state researchers. Siam weed (Chromolaena odorata), a commonly seen plant in Kerala, is locally known as “Communist Pacha (green)”, as it spread all over the state within a short span of time just like Communism did during the same time, the 1950s. Native to the Americas, Siam weed was an invasive plant which took over the barren lands of Kerala, after which many native species like the medicinal plant Sida cordifolia started disappearing. Researchers point out that wild growth of invasive alien plants is a major environmental issue in Kerala, which needs immediate attention. Though this is a worldwide, long-term phenomenon, now, after the Kerala floods, scientists seek immediate attention to the issue in the state. The Kerala Forest Research Institute (KFRI) has an ongoing study into it. The invasion of alien plants mainly happens in forest, unattended or barren lands and in agriculture areas. According to KFRI, invasion in agriculture fields is usually prevented to an extent due to constant weeding and proper care. But invasion in forest areas and other lands is a significant problem as it negatively impacts the native species and ecological balance. The study focuses on invasions in forest areas where the KFRI has been tackling the problem by organising different programmes. T.K. Hrideek, scientist, Genetics and Tree Breeding, KFRI told Mongabay-India that all the forest regions in the state are under this threat. Major alien plant species like Senna spectabilis, Hypoestes phyllostachya, Maesopsis eminii, Mikania micrantha, Lantana camara, Eupatorium cannabinum and others invade forest regions including wildlife sanctuaries. 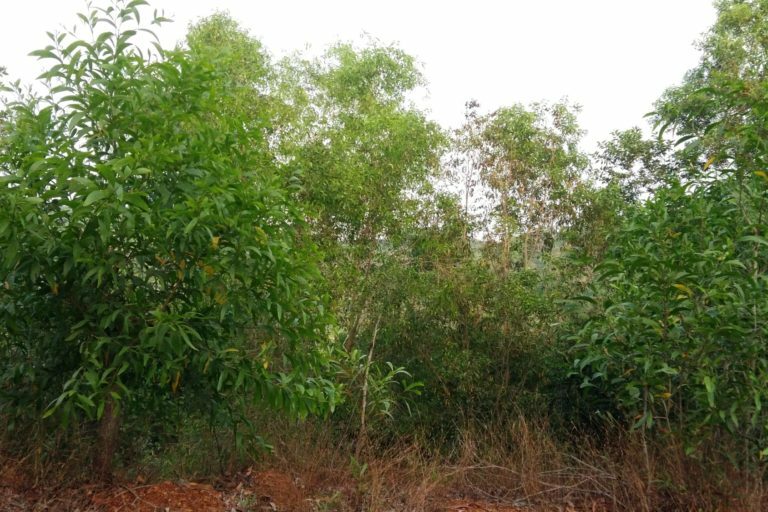 KFRI’s survey revealed that Senna spectabilis (locally known as “Manja Konna”) shows an increase of more than 10 percent from 2015. “They were planted as avenue trees along roadsides in the state. But soon spread into wildlife sanctuaries as well as in plantations due to their high invasive nature. Allelochemicals produced by Senna spectabilis prevent germination of many native species,” Subi, a research scholar at KFRI said. “During the floods through tributaries of Kabani river, Senna seeds were dispersed,” she added. Invasion by alien plants directly affect the germination and survival of local species, damage the quality of soil and affect underground water availability. They change the ecosystem and intrude into the food chain, with harmful affect on animals. In Kerala, other than being a threat to native species, this trend of invasive plants can affect Kerala’s ecotourism, the livelihoods of indigenous tribal communities and also impact the lives of native wild animals. “The forest regions in the state, including Wayanad Wildlife Sanctuary, have got a number of invasive plants and trees. The situation is similar in other protected areas too. At present people may not realise it, but later tourists may not experience the forest they desire. It might look like a plantation. There will not be any animals as they cant feed on these invasive species,” said Hrideek of KFRI. He also pointed out that such plants could affect the livelihood of indigenous tribal communities who depend on collection of non timber forest products. “Communities who collect certain grass, fruits, honey, bamboo or medicinal plants for livelihood are badly affected through this invasion. Some invasive creepers can also prevent the easy movement of these indigenous people inside the forest,” he added. The spread of invasive species also impacts the food chain. The spotted deer, which is a common sight in Tholpetty and Muthanga regions in Kerala, face food scarcity as the native plant species that it feeds on are disappearing. “The food scarcity and habitat change caused by this invasion can be one of the reasons for animals crossing forest limits and appearing in human-occupied areas,” Hriteek pointed out. He said most of the invasive trees will have attractive flowers that can lead to an easy pollination of them by insects. “Through this pollination, native species are neglected and these exotic species get spread easily,” he added, stating that such uncontrolled invasion can cause economic loss along with environmental issues. “Weeding in agriculture land and weed removal in ponds and other sources costs us a lot. But we don’t realise it as a major issue,” he explained. There are many species used by individuals for different purposes that later turn to invasives and destruct other plants. Mucuna bracteata, a kind of leguminous plant used by farmers in rubber plantations to regulate nitrogen and control soil erosion, also spreads rapidly and prevents the growth of other plants and trees. Sphagneticola trilobata is another plant which is also used as garden plant that produces beautiful yellow flowers. “It is widely seen in unattended areas, but once it is spread, no plants will sprout in the area,” said Hriteek. According to the researchers, presently the research in to this issue is fragmented and an organised state policy to tackle this environmental concern is needed. There is no detailed study or survey to determine the the data of such invasions in unattended lands, agriculture areas and forest land. Researchers at KFRI seek proper surveillance over the issue. “It is not easy to track the routes of invasive plants, but proper surveillance can prevent them to an extent. People who import exotic plants, nurseries who sell them etc. should be examined. Decades ago, Acacia mearnsii trees were used for commercial purposes. Now, shola forests of Kerala are covered with those trees. They badly affect the groundwater sources,” one of the scientists at KFRI said. Acacia in fact was not actually invasive and was brought for plantations. But since it was not economically viable, it was abandoned, but spread widely. Acacia mearnsii trees been grown widely in abandoned land. Photo by Haritha John. The KFRI and forest department have organised various drives to eradicate invasive species and bring awareness. There have been frequent drives to uproot Senna spectabilis and promote native species of grass, bamboo, medicinal plants and trees. “After the Kerala floods, the situation has worsened as landslides and the overflow of rivers have set route for invasive species to move around easily,” Hriteek pointed out. Water hyacinth (Eichhornia crassipes) and giant salvinia (Salvinia molesta), the invasive species found in backwaters started appearing in paddy fields after floods. “Many invasive species that are found in mountain regions were spotted in plains after the flood. They can grow easily even in adverse environment, but native species may not sustain situations like landslips. Landslides have helped plants like Mucuna bracteata to reach protected forests,” K. Muraleekrishnan, a research scholar with KFRI said. Hriteek pointed that this threat from invasive plants should also be considered along with reconstruction measures of the state after flood. The article, originally appeared on Mongabay-India, is republished under Creative Commons license.